A friend once told me, "I love all your posts, but I have to admit, on Sundays you could really write anything. I'm just there for the gorgeous cakes." ...and then fill up the page with whatever I want. It's a Sweets filibuster! Does anybody have a copy of Green Eggs and Ham? No? Ok, never mind. I'll improvise. But, soft! what light through yonder window breaks? It is the east, and Juliet is the sun. Arise, fair sun, and kill the envious moon, Who is already sick and pale with grief, That thou her maid art far more fair than she. A towel is about the most massively useful thing an interstellar hitchhiker can have. You can wrap it around you for warmth as you bound across the cold moons of Jaglan Beta; you can lie on it on the brilliant marble-sanded beaches of Santraginus V ... and of course dry yourself off with it if it still seems to be clean enough. I read some 4 and 5 star reviews by those who used this device successfully to change a baby while driving. On that basis, I bought one. I put my baby on it and drove for over an hour. It did not change. Same baby. I am glad it worked for some people but I will be returning mine. "You are using Bonetti's defense against me, ah?" "I thought it fitting, considering the rocky terrain." "Naturally, you must expect me to attack with Capo Ferro." "Naturally, but I find that Thibault cancels out Capo Ferro, don't you?" ...and I believe you should put a woman on a pedestal.. high enough so you can look up her dress. And I believe in equality, equality for everyone.. no matter how stupid they are, or how much better I am than they are. And, people say I'm crazy for believing this, but I believe that robots are stealing my luggage. A king cake is a type of cake associated in a number of countries with the festival of Epiphany at the end of the Christmas season, and in other places with the pre-Lenten celebrations of Mardi Gras / Carnival. The cake often has a small plastic baby (said to represent Baby Jesus) inside (or sometimes placed underneath), and the person who gets the piece of cake with the trinket has various privileges and obligations. 1. Take ice tray over to the sink and fill it with cold water. 2. Place the water-filled ice tray back in the freezer. 3. Shut the door to the freezer. During the rectification of the Vuldrini, the traveler came as a large and moving Torg! Then, during the third reconciliation of the last of the McKetrick supplicants, they chose a new form for him: that of a giant Slor! Many Shuvs and Zuuls knew what it was to be roasted in the depths of the Slor that day, I can tell you! That's it! The filibuster's over. Thank goodness these Sweets speak for themselves. 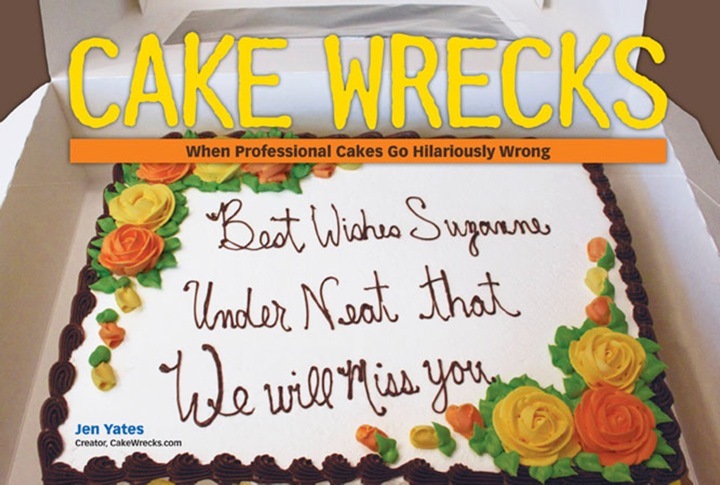 We only get one reason for coming to Cake Wrecks? Then I choose "the people." Aaaah, a Madeline Kahn Clue reference! "Well, it's a matter of life after death. Now that he's dead, I have a life." And to think people said that king cakes would never make Sunday Sweets! first time commenting here, but have been following you for years...love the "eyeCake" and really enjoyed the adventure of accompanying unrelated written comments...not that I don't always enjoy your related adjunctive comments! Thank you for the Sunday start of my day! I admit it..I was right there with your friend on Sundays. Until today. So funny! I just love your sense of humor. "How does one carry on a lengthy filibuster without a restroom break?" p.s. does recognizing the sources of your filibuster make me a nerd? Oh, I hope so! "he wasnt a very good ilushonist"
I want the black and white "love" script one. And the funky colored bird one. Please? If I ask very nicely? "But your souls are in danger!" "Our lives are in danger, you beatnik!" I can't believe someone else has seen that movie. Also, neat cakes! February 16, 2014 | Tabitha W.
The cake with the lyrics to "More Than Words"! Be still my 1990 heart. To quote Steve Martin, "Some people have a way with words. Some people no have way." And you have way. Love the words you chose today...and the cakes are cool too. The kitteh under the table on the last cake is too cute! Who cares if he's sleeping whilst the mousies play. 2. I thought it was Up Up Down Down Left Right Left Right A A B B Start? Or am I mistaken? 4. Is that a real, lighted candle on that cake? And a kitten hiding underneath? Squee! I was so busy reading the post that I missed the cakes. Were they nice? Could very well be the first Sunday Sweets that have actually made me laugh! Sweet! All of those cakes were absolutely gorgeous but I think reading the hilarious filibuster took my attention away from the cakes. I especially liked the part about changing the baby. I'm going to go back through and look without reading to enjoy them the way they should be enjoyed. Great post today! The funny part was I stopped paying attention to the cakes just to see what was written next! I was so busy reading and trying to ID quotes that I had to go back and look at the cakes! Funny, and pretty. The best [and usual] combination! I was already a fan of the witty commentary here. But this is just brilliant! And so are the cakes. But I'm with Haiku Joy: It's the people who keep me coming back. For seconds and thirds and fourths. Eek! You used the Konami code!!! I'm doing a Kermit flail over the Clue reference, one of my all time favorite movies! oh, and the Cakes are gorgeous, of course! 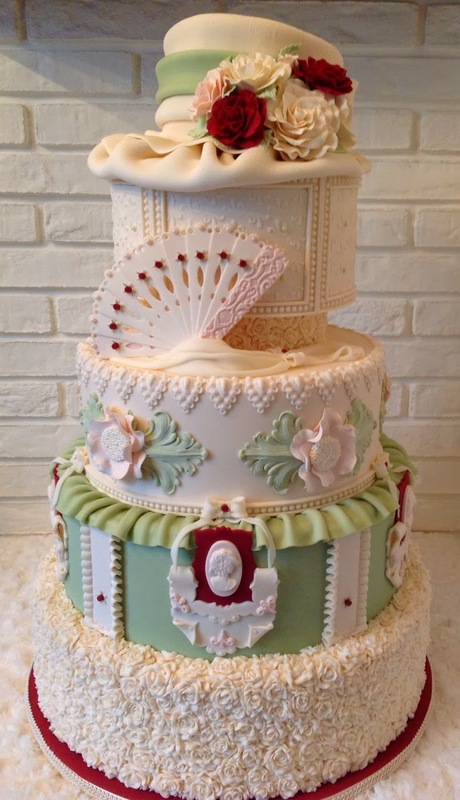 if i ever had one of the gorgeous cakes you show on sunday i'm not sure i could ever cut it - but, eventually, it would look like miss havisham's wedding cake. i would definitely want to have pictures of the cake before it is cut. +1 Clue reference, that made me giggle. Eh, maybe you should stick to talking about the cakes on the post. Next time I read a post, I'll read the introductory notes, first. This gave me the most serious "WTF?" moments I have had, here. Great cakes, though. Keep up the good work! Hitchhikers, Princess Bride, Clue, Shakespeare...so much happiness on one page. Thank you! Absolutely Epic!! I love it! And the cakes are fantastic too! I for one would love it, if you would, somewhere near the bottom of this post, or in the comments, cite your sources. You know, so that we can laugh at all the inside jokes... Or maybe I'm just pop culturally illiterate. I shouldn't read the comments; they only confuse me. Love the cakes, love the commentary! Absolutely, definitely the most gorgeous cakes in the universe! Do these artists not just despair to see these cut and eaten? It took me three cakes to realize that there wasn't any relationship between each cake and the text beneath! Still, that was great filibustering, and some unusual and lovely cakes! Thanks. Well, I HAD to google some of the clues... (Not being a native speaker.) But a lot of good clean fun nevertheless. 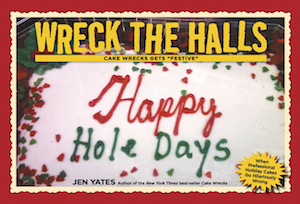 Which is surprising for CakeWrecks (the good clean part, natch). I recognized at least half of the random comments! The Ghostbusters quote...I just hear Rick Moranis in My head!!! I'm too old and out of the loop to get all the references but am so impressed jut that you are well-read enough to make them :-) and put them here for my entertainment! That cake with the frog eating the top of the building has my jaw on the floor and i may never pick it up... One of the best internet blog posts ever today and I've even been the star of a couple :-) Congrats! This was a deliciously fun, witty, amusing and beautiful break from a long day of sick kids and homework. The most beautiful cakes I have ever seen interspersed with interesting quotes that have nothing to do with cakes (for the most part). Good job! You are one hoopy frood, you know that right? Between the cakes and the text I can't stop smiling!